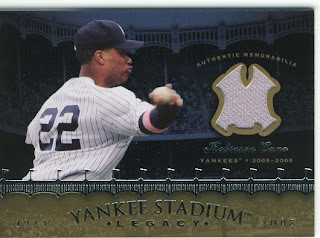 Here is another sweet card that I am thrilled to have won at such a great price. When you only get one of these per case, and land one for like $12, one should do cartwheels (and no, I have no idea how and I am not trying). This card is part of my weekend that consisted of bidding on things I have no money for and logging cards. I figured if I stay home, the money I would have spent by going out can buy me baseball cards. My Robinson Cano collection keeps growing, and my wallet keeps shrinking.